The Medalion Foundation, part of the Centura Health at Home Foundation, is proud to support the residents of Medalion Retirement Community in Colorado Springs. Our foundation raises funds to assist in providing programs and activities including exercise and therapy programs, a resident library, computer lab and supplies needed for chapel services and dining needs. The Medalion Foundation provides funds for medically-equipped vans and buses to transport residents and medical support equipment such as wheelchairs, walkers and motorized carts to assist residents with mobility challenges. Donations also help provide financial assistance for residents who have no other means of paying for medical services. We help seniors make the most of every day and your help is needed. 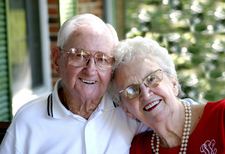 Your entire donation will go directly to benefit Medalion Retirement Community.